I’m surprised that many indoor air quality assessments do not include any measurement of pressurization. The difference in pressure between two rooms will dictate the direction of airflow. Air will move from high pressure to low pressure. How do you measure the pressure? The quantitative way of measuring pressure is with a differential manometer. Two small rubber tubes are attached to the manometer and run into the two areas to be measured. 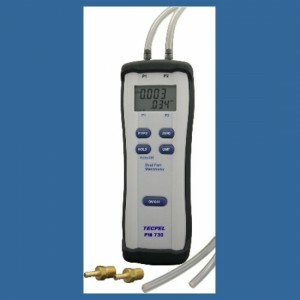 The manometer will display the pressure difference in inches of water gauge, Pascals, or other various units. The problem with these devices is that the tubing doesn’t always fit nicely in the doorways or openings separating the areas being measured. Imagine trying to pass a tube through a doorway without any undercut below the door. You need to keep the door open to run the tubing through, but that changes the pressurization. On most jobs I prefer to measure pressurization qualitatively. I’m usually more interested in knowing where air is moving than knowing the exact Pascal pressure differential. To know which way air is moving, we need a tool to help us “see” the air. For most of my career I have used ventilation smoke tubes from MSA. After crushing two hermetically sealed glass ampoules, a chemical reaction occurs resulting in the generation of buoyant smoke. 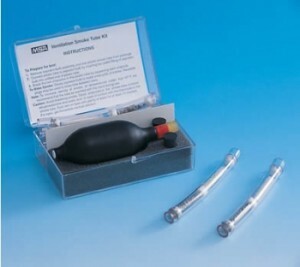 The black aspirator bulb pushes air through the tube to puff the smoke out. Although this isn’t purposefully irritating (like an irritant smoke tube), it still will make you cough if inhaled. I’ve always been on the look out for a better smoke tube. I’ve tried powders, wicks, and even the 6 STP1 method. If you know of any other great products to measure airflow, please leave a comment on this blog post here. Just so you know, the developers of the Wizard Stick, the guys at Zerotoys, are friends of mine. I was sort of instrumental in getting the word out and encouraging them to develop a model for the building scientist. It’s nice when you get to make a difference in this world. I’ll definitely be purchasing one if it has your endorsement! I’m really excited about getting a new gadget, especially one that is less than $100!